Within a two-month span, Lakers coach Mike D’Antoni has viewed Nick Young as a a streaky shooter and inconsistent defender to a candidate for the NBA’s Sixth Man of the Year award. Although the Lakers have officially ruled Kobe Bryant out when they play Sunday against the Portland Trail Blazers at Staples Center, it’s possible he will return when the Lakers visit the Sacramento Kings Friday at Sleep Train Arena in what would mark his first game since shattering his left Achilles tendon seven months ago. The Lakers unexpectedly practiced Saturday so Bryant could squeeze in a session of five on zero drills that mostly entailed shooting exercises. But the Lakers are hoping that three full-court practice sessions beginning Dec. 3 could pave the way for Bryant’s return. 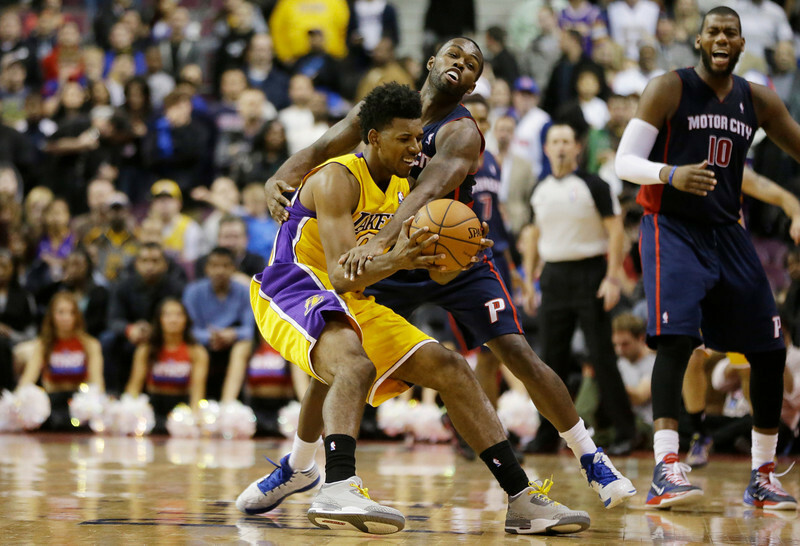 You read about the Lakers’ 106-102 win Friday over the Detroit Pistons at the Palace. You read about Nick Young making a key defensive stop. 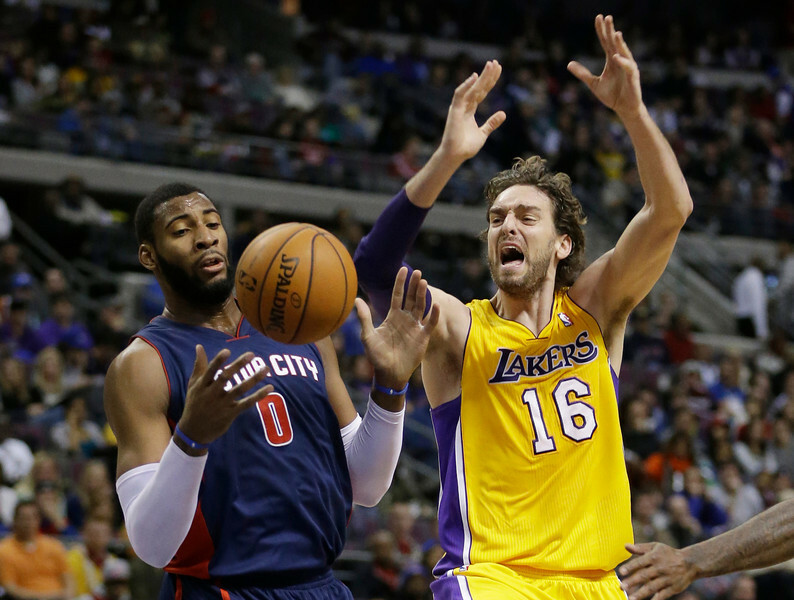 You read about Pau Gasol becoming thesecond high scoring European player in NBA history. You read about the Lakers’ reaction to Nets coach Jason Kidd spilling a cup of soda in the previous game and earning a $50,000 fine from the NBA. But pictures always tell a 1,000 words. And in the case of LANG’s photo gallery of the Lakers’ win over Detroit, plenty of his images tell various stories. AUBURN HILLS, Mich. — Nick Young lay on the ground and darted his eyes anxiously toward the official. The Lakers forward then furiously kicked his legs up in the air and yelled at the top of his lungs. Young had just drawn a charge on Detroit forward Josh Smith. And though Young’s ensuing free throws ensured the Lakers’ 106-102 victory Friday over the Detroit Pistons at the Palace, his defensive play helped turn the tide. With Young establishing a shoot-first, play defense mentality through six NBA seasons, even his longtime friend struggled processing it all. So why didn’t Young provide this defense before in his six year NBA career? AUBURN HILLS, Mich. — In this case, the NBA was hardly crying over spilled milk. Instead, they called foul over spilled soda. Nets coach Jason Kidd drew a $50,000 fine for intentionally spilling a drink on the floor in the waning seconds of the Lakers’ 99-94 win Wednesday over the Nets in an attempt to stop the game without any timeouts remaining. AUBURN HILLS, Mich. — The Lakers waived rookie Elias Harris Friday after playing a limited role this season, compiling a rebound, assist and steal through two games in 11 minutes. The Lakers signed the undrafted Harris this summer to a two-year deal, which involved a partial guarantee at the veteran’s minimum his first season ($490,180). The Lakers then held a team option on his second season, which would’ve been worth $816,482. Harris’ contract would have become guaranteed had he stayed on the Lakers’ roster beyond Jan. 10. Harris, who won two-time All-West Coast Conference honors when he played for Gonzaga University, started all five games for the Lakers’ 2013 Vegas Summer League team, averaging 10.2 points, 5.6 rebounds and 1.2 steals in 27 minutes. In his own D-League appearance with the D-Fenders, Harris posted 18 points on 60 percent shooting in 28 minutes. The Lakers currently have 14 players on their roster. All teams can hold a maximum of 15 NBA players, though the Lakers don’t plan on filling the vacant spot. It turns out Magic Johnson has never put a ring on it. Magic Johnson, keeper of five NBA championships, remains so paranoid about losing his five precious NBA championship rings that he’s never worn them. Not when he’s admiring them in a private moment. Not when he’s around his former teammates. Not even when the Lakers were presented with the rings on opening night the following season. In an upcoming appearance on Oprah Winfrey’s self-named network airing Sunday at 9 p.m. Johnson divulges to the famed talk-show host his fear of the bling. Those marked one of the many topics Johnson discussed with Winfrey. The famed Laker also touched on how he broke the news to his teammates in 1991 that he had tested positive for HIV and later in a press conference. Plenty presumed Johnson was simply a dead man walking. But 22 years later, Johnson’s still surviving and has become a key advocate for through his self-named foundation in raising AIDS and HIV awareness through education, treatment and research. That’s included aiding 135 million people through community grants, education, scholarships, clinics and adding mobile testing units. Meanwhile, Johnson has still maintained to live a full life. He’s become a part of the ownership group that runs the Dodgers. Johnson owns several businesses. He’s lived to see his son, E.J., grow up and has supported him in his recent public revelation that he’s gay. Clearly, Johnson’s not afraid of handling adversity and tackling many projects. But he’s still worried about losing jewelry, an understandable phobia considering his storied career with the Lakers involved collecting plenty of it. AUBURN HILLS, Mich. — Though he’s nursing a sprained ring finger in his left hand, Nick Young plans to play when the Lakers (8-8) visit the Detroit Pistons (6-9) tonight at the Palace of Auburn Hills. Young is expected to wear a splint on his finger after injuring it in the Lakers’ 99-94 win Wednesday over the Brooklyn Nets after Paul Pierce wacked him as he drove to the basket. X-rays turned out negative, and Lakers trainer Gary Vitti taped his finger afterwards. Young scored a season-high 26 points against Brooklyn, and has averaged 17.8 points on 46.3 percent shooting in his past five games. But it remains to be seen how Young’s finger injury could affect his shooting stroke and ball handling, though it’s on his non-shooting hand (left). 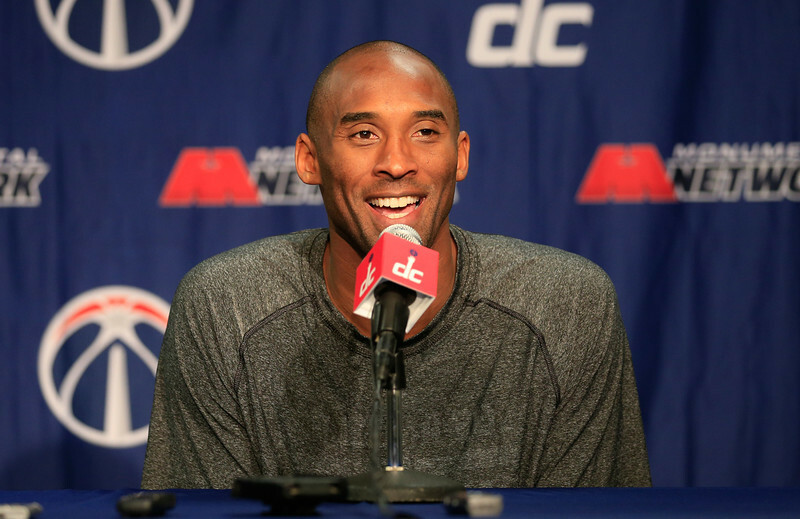 Kobe Bryant had worn a splint on his right index finger after fracturing it during the 2009-10 season. Throughout the season, Bryant tinkered with how to play through it. That ranged from taking the splint on and off and transferring the pressure from the ball’s release to his middle finger. Next time, Jason Kidd might want to put a lid on his cup. Or keep track better of his timeouts. The NBA fined the Brooklyn coach $50,000 for intentionally spilling a drink on the floor in the waning seconds of the Lakers’ 99-94 win Wednesday over the Nets in an attempt to stop the game without any timeouts remaining. Kidd appeared to tell Tyshaun Taylor “to hit me.” Taylor obliges and knocks into Kidd’s shoulder, causing the Nets coach to drop his soda on the floor. The move appeared to try to ice Jodie Meeks at the free throw line and give the Nets a chance to draw up a final play with 8.6 seconds remaining. Meeks hit both free throws. Then, while Nets assistant John Welch drew up a final play for Paul Pierce, Steve Blake and Xavier Henry listened in on the huddle. Pierce had a wide-open three-pointer, but the shot misfired. So did Kidd’s explanation afterwards. 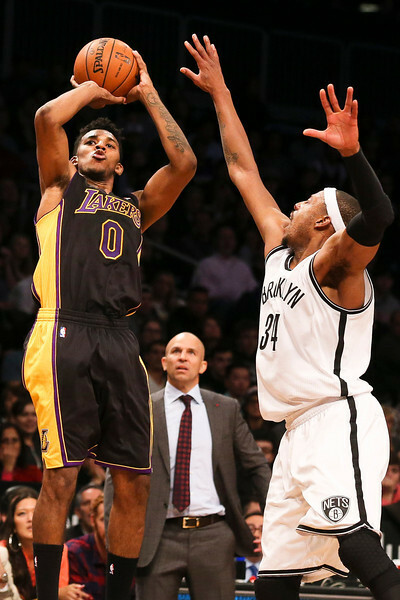 You read about the Lakers’ 99-94 win Wednesday over the Brooklyn Nets at Barclays Center. You read about Nick Young spraining his ring finger on his left hand. You read about Pau Gasol becoming the second high scoring European player in NBA history. You even read about Nets coach Jason Kidd apparently spilling a cup of soda on the floor in hopes of freezing Jodie Meeks at the free throw line. But pictures always tell a 1,000 words. 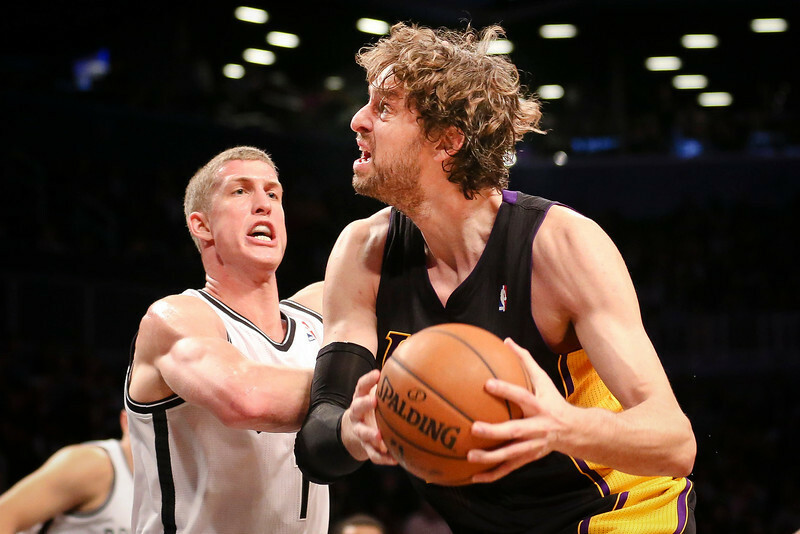 And in the case of LANG’s photo gallery of the Lakers’ win over Brooklyn, plenty of his images tell various stories.